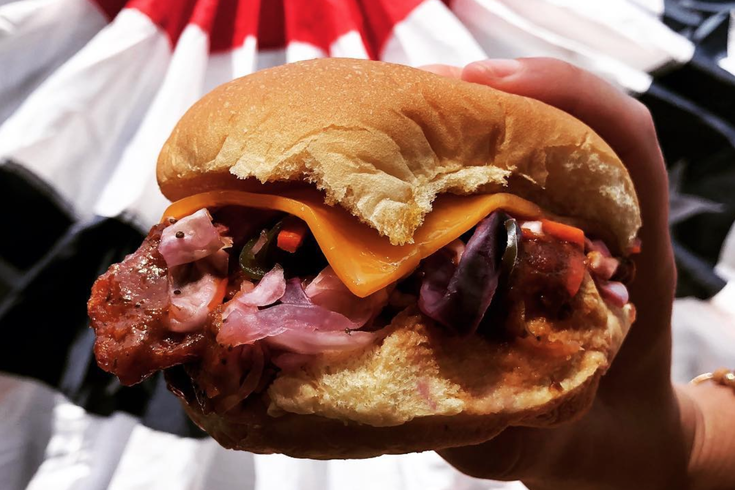 Federal Donuts is offering a barbecue fried chicken sandwich for a limited time. The chicken sandwich has a coffee-barbecue sauce made with Federal Donuts' own java blend and is served with cole slaw and cheddar cheese on a potato roll. It will be available at Philadelphia stores from Friday, July 6, through Sunday, July 8. This weekend, for the blink of an eye, the menu at Federal Donuts will get a brand new addition. Whereas limited time specials are usually donut-related at the Philly-based shop that has concocted such notable treats as the Irish Potato doughnut and the Iggle doughnut, this time the menu will get a boost with a very festive, very summery new sandwich: the barbecue fried chicken sandwich. What separates the sandwich from others is the barbecue flavor, which is made with a coffee-barbecue sauce using Federal Donuts' own java blend. The meal also comes with slaw and cheddar cheese on a potato roll. The window for snagging the new dish is extremely limited. Store locations in Center City, University City, South Philly, and North Philly, the Fairmount Whole Foods, and Citizens Bank Park will begin selling them Friday, July 6. The sandwich will only be available through Sunday, July 8. Federal Donuts rolled out its only other fried chicken sammie a few years ago, first billed as a seasonal option at Spruce Street Harbor before becoming available across all locations throughout the year. Perhaps that also shall be the fate of this new barbecue chicken sandwich? Fingers crossed.